You have probably heard that fruit is crazy expensive in Tokyo, right? There’s a lot of blogs and travel sites claiming that shopping for food, in particular fruit, in Tokyo costs a small fortune. It’s only half the truth. Yes, you can find a cantaloupe for $160 USD! Yes, that’s right this is not a typo, not $16, but $160 USD for one single cantaloupe, or rockmelon, depending which side of the pond you come from. The image of the canteloupe was taken by me during my last trip to Japan while shopping in Takeshimaya Times Square, a Japanese department store. 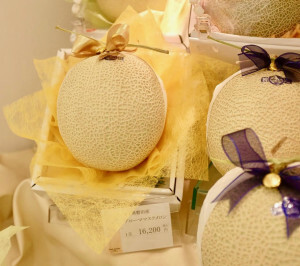 The single melon, priced at 16,200 JPY (around $16o) is a ‘gift’ cantaloupe. In western cultures, and in fact most cultures, fruit is valued for it’s nutritional value and natural taste. 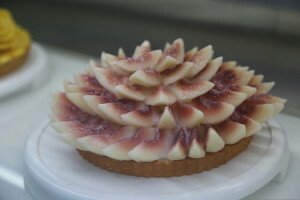 Japanese people relate fruit, perfectly engineered fruit, to social and cultural success and respect. In Japan it’s customary to give someone a perfect piece of fruit as part of the ritual gift-giving practices that are valued in Japanese culture. Before you scoff at the site of a $160 melon, you must know that in 2016 a pair of premium Hokkaido cantaloupe sold for a record-breaking $27,240 (3 million Japanese Yen)! But wait, hold onto you grapes, there’s more! First released in 2008, the famed ‘Ruby Roman’ grape is the world’s most expensive grape, today individual bunches can sell for over 100,000 yen ($880) each — but that price can go much higher. 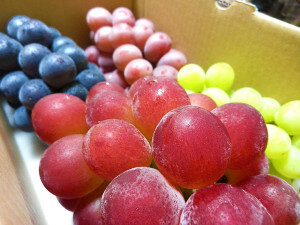 Last year, a supermarket paid $9,700 US dollars (1.1 million yen) for the first-harvest bunch of the golf-ball sized grapes. The bunches have 30 grapes in total, that’s a record-breaking bunch! Each grape selling for $320! The farmer growing the Princess Strawberries only cultivates 500 per year and strives for the ‘perfect shape’ strawberry with each and every one. The endless pursuit for perfection in Japan is deeply ingrained in the the culture. There is a term in Japan called ‘Kaizen’. It translates to: ‘The relentless pursuit of unattainable perfection’. In Japan, rather than having many different roles and interests or what we call in the West, ‘multi-tasking’. I love this about Japanese culture. I love the fact that a barista wants to be a barista and that cup of coffee you get in Japan is the closest thing to perfection that you are ever going to experience in your life! In the USA, mainly LA, and many other places, often your barista has a ‘side-gig’ and generally is a wannabe something else so you end up with a cold, crappy cup of coffee that you didn’t order! 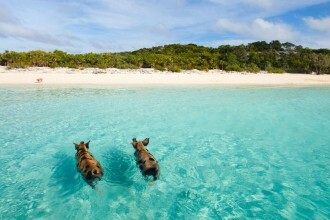 Not in Japan! I wont go into this term of ‘Kaizen’ too much as I talk more on this in the food section on Japan and my other blog posts on Japan. I am posting a clip about ‘Kaizen’ from Japan soon where you can view the impressive skills of a soba noodle maker artfully hand-cutting each noodle into exactly the same thickness. 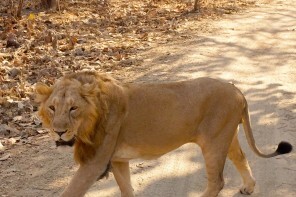 This ‘art of perfection’ is valued and gifts must also have this perfect appearance. 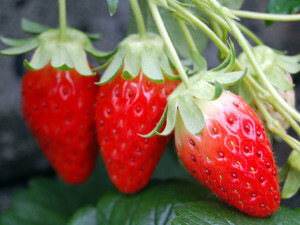 Often gifts, even a single strawberry are wrapped up perfectly in Japan- there is no ripping paper of presents in Japan. You can read more on cultural faux pas in Japan in my post about what not to do in Japan. In Japan, giving a gift like one of these expensive, perfect fruits is to demonstrate a respect and fondness of the recipient, for a special occasion or for someone socially important, like a boss. If you’re looking for the perfect gift for your Japanese friend or colleague make sure that it’s perfect! A typical fruit basket or bunch of flowers just wont fly in Japan! Have you eaten expensive fruit in Japan? 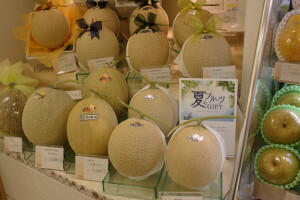 Have you received one of these cantaloupes or any other perfectly engineered present as a gift in Japan? I would love to know! 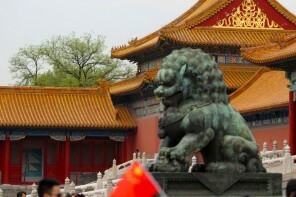 For more on Tokyo see my post on the best way to spend a day in Tokyo Japan.